Gleaming beauty is on display from the angelic creature above to the radiant reflector at the base of this finial. The angels heard on high - Radko finial shows off every bit of the quality and elegance we've come to expect from Radko tree toppers and finials. 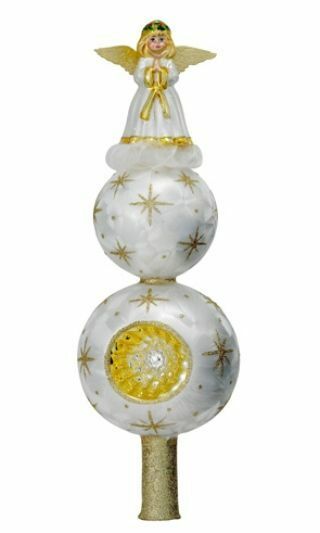 This Polish blown glass, handcrafted piece will be cherished for generations in your family, and it's a lovely gift full of meaning for anyone on your Christmas list. Adorn your tree or mantelpiece with exquisite beauty that will be deeply appreciated by all who view the Radko angels heard on high glass finial.